You know how nothing makes you appreciate where you grew up more than leaving it? Well, the other half of that must be that nothing makes you appreciate your adopted country more than showing it to others. This past week, two of my friends from college come over for a visit (Spring Break at its dampest). After an incredibly hectic journey over with multiple close calls and an unplanned layover in Manchester, they were determined to stay up the whole first day. One of my favorite things to do when I’m in a new place is to go to the grocery store, and see all the different brands and flavors and packaging. So after a big breakfast and lots of tea we strolled to SuperQuinn and picked out some sodabread and Taytos and MiWadi to try. 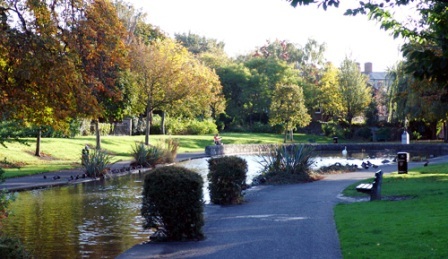 They were fading after lunch so we headed back out for coffee at Coffee Stop and a walk around the Ranelagh Gardens. Later that afternoon we got back in the car to take the scenic route to Danny’s family’s house in Wicklow. By this point the sun had begun to come out, and as we drove towards the Sally Gap we enjoyed a dramatic combination of mist, streaky sun, and snow. With every new view my friends’ shrieks of delight increased, and by the time we got to Danny’s house they had utterly exhausted themselves. Tea and biscuits by the peat briquette fire put them over the top, and they snoozed on the way home. Day 2 began with the National Museum of Archaeology andHistory on Kildare Street. I had never been and was really eager to see the bog men, and I thought it would be a good beginning to my friends’ trip. It has an extensive collection of weapons, jewelry, and tools from ancient Ireland. Like the Natural History Museum, the building itself is beautiful and interesting in its own right. The bog men were frightening, cool, sobering, disturbing, funny, gross, and fascinating. I’ll definitely be taking all future guests here. Apologies for all the adjectives, but I was really impressed! It was bucketing down freezing rain, but my friends were not to be deterred. (“It’s what we expected!”) We walked all around Trinity’s campus, then met Kev and lunched at Munchies on Wicklow Street, where they tried Ballymaloe relish. We walked up to Christchurch afterwards with the hope of going in and exploring, but refused to pay €6 each to do so – hot chocolate at the Queen of Tarts on Dame Street was much more appealing. On Wednesday the girls went to London for a whirlwind 24 hours. They managed to see all the sights on their list and were taken out on the town by an old friend from camp. (All of my Irish friends found this hilarious. Camp! Wow, you really have camp? What is it like?) They stopped by the shop I’m now working at to get my key on their way back, and took my boss’s advice and had a hot dinner waiting for me when I got home! They stayed up late planning the next 48 hours’ adventures– a trip to Galway and two bus tours taking in tons of sights that I’m dying to see myself. They were out the door at 6:30am on Friday morning to catch a 7:15 bus from Suffolk Street. They had an amazing time and raved about their bus driver/guide. They had their first Guinness (and stole their first pint glasses) while listening to some trad in a Galway pub that night. On Saturday they saw the Cliffs of Moher and drove all around Connemarra, and walked in my door (bearing Thai food for all) around 10 that night. And amazingly, they were up for a night out! We accidently stole a taxi that had been ordered for someone else, and met Kev and his friends at Siné on Ormond Quay. Everyone found one another hilarious and odd – a successful night. On Sunday they enjoyed a much deserved lie-in, and picked me up from work in the early afternoon. We walked towards town and had coffee and food at The Humble Bean on Aungier Street. In the center we tried on sweaters and considered more souvenirs, and strolled through Stephen’s Green and the Iveagh Gardens (great even in grey gloom). We went back to SuperQuinn and Tesco where they bought tea and bread and Ballymaloe as gifts for friends and family back in the States, and headed home for a last night in. Kev stopped by with a pavlova from his mum and the girls showed us their Galway photos. We ordered a taxi, they packed, and five hours later we said goodbye. It was so nice having guests who arrived wanting to see and learn things, and who were so easily pleased. I love the Irish, but you can’t beat American enthusiasm. Thanks for coming guys!